If you are looking for a tour with a more than just a stroll, a lecture, and a bit of sight setting, then Cre8 Lifestyle is just who you need to take you round London. On the 9th of March they are running a Street Art Tour of Hoxton that offers a whole lot more than an hour gazing at walls. The £15 tour will start at 11am from Hoxton Station. Here you will leave the concrete greys and red brick walls to encounter 'some of the most colourful and creative conceptual and contextual street art and graffiti in and around east London.' 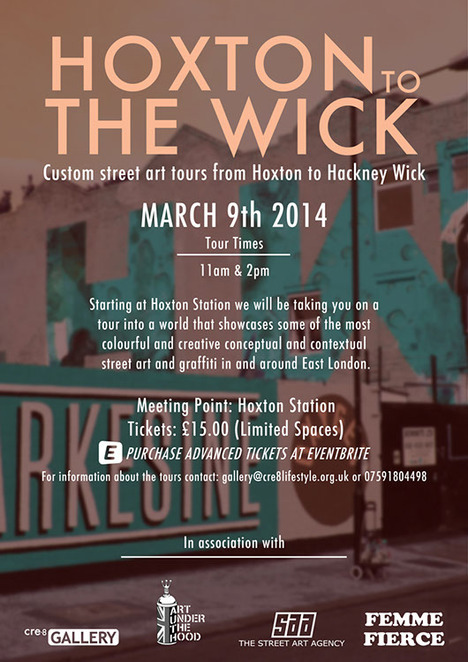 The tour will end in Hackney Wick to be followed by a free graffiti art workshop, where you have the opportunity to try your own hand at some street art. There is a second tour at 2pm, which is followed by free entry to Femme Fierce: The All Female Street Art Extravaganza. This is a seven day festival that celebrates and showcases some of the UK's best female street artists, and asks you to imagine what it would be like with women ruled the world. The extravaganza will include a free screening to the world premiere of Women On Walls, a street art documentary by Danish director, Cathrine Cort Koppel. Koppel and a number of the artists featured in the documentary will be at the screening for a post Q&A.